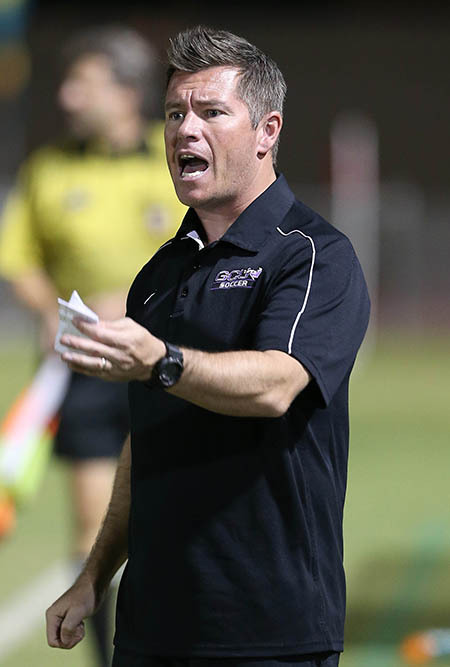 Schellas Hyndman made an immediate impact on the GCU men’s soccer program when he was hired earlier this year. “There are so many great things here,” he began, warming to the subject the way a summer day in Phoenix tends to test a thermometer’s upper limits. “I loved where I lived (Dallas). It was more of a personal challenge to me to give up that comfort zone and come here. “But I was truly excited to be working with Mike Vaught (GCU’s vice president of athletics) again, and the first time I met President (and CEO Brian) Mueller, it was like, ‘Wow, where has this guy been my whole life?’” You can’t help but think of the scene in “Scent of a Woman” where Al Pacino bellows to the assembly, “I’m just getting warmed up!” Let the man talk — he has more to say. “I think the impact we can make is the same thing we learned when we were children and our parents told us, ‘Always be cautious of your first impression. It’s everlasting,’” Hyndman said. “I want to have a really good impact here — I use the word ‘impression’ — that we’re committed to this program. So where is the GCU program? It’s the only NCAA Division I men’s soccer program in Arizona, in an area that loves the world’s most popular sport. It’s the focal point of what promises to be a beautiful new stadium, scheduled to open next year. And it aims to be a nationally recognized destination for the top collegiate players, led by a man who is sixth among D-I coaches with 466 victories. 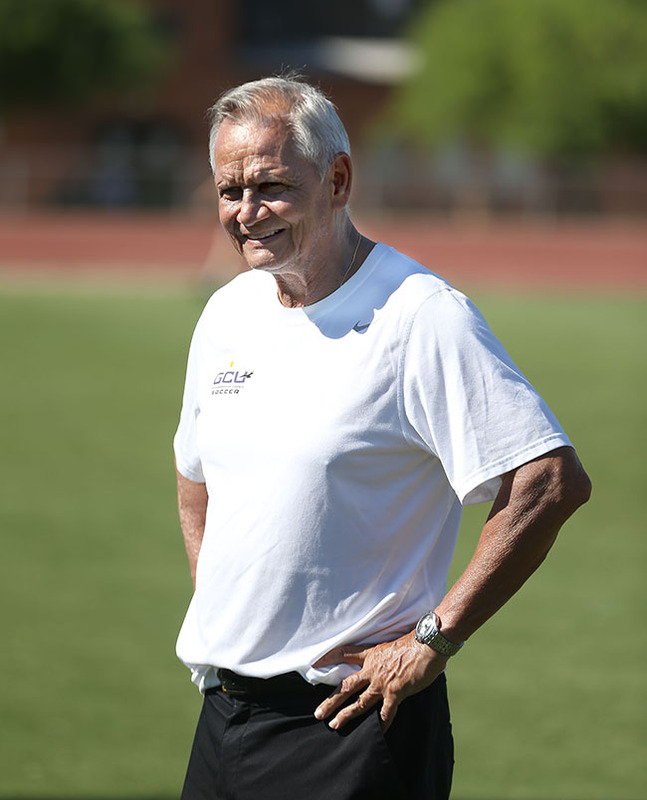 Soccer is about to be a much bigger deal at GCU. Friday night games this season will feature a student “March to the Match,” and the Havocs student section, the Thundering Heard Pep Band and the cheer and dance teams all will be part of the festivities at home games. Soccer will be to the fall sports season what basketball is to winter’s. Vaught had witnessed Hyndman’s magic touch firsthand when he was SMU’s deputy director of athletics, and when Vaught approached Hyndman about the job, he was considering three other coaching offers and also was the keynote speaker at the National Soccer Coaches Association of America convention. 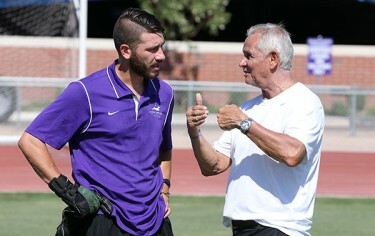 Other GCU coaches have tapped into Hyndman’s wealth of knowledge. “He’s a great guy, and it’s nice to have someone like that who is very forward-thinking,” women’s soccer coach Stevie Gill said. Gill, like Hyndman, is looking forward to a season in which both GCU teams have high hopes. The GCU women, whose schedule includes a visit to defending national champion Florida State, won seven of their last eight matches last season to tie for third in the Western Athletic Conference and figure to be a WAC title contender this year. Goalkeeper Luca Licciardi (left) values Hyndman’s coaching acumen. The forecast for the GCU men is equally bright, and it started with the arrival of Hyndman. “His desire to coach the players and create relationships with them was instantly noticed,” goalkeeper Luca Licciardi said. Hyndman noticed in spring practices that “we have some pretty daggone good players right here — they just need a little bit of refining.” And the players certainly noticed Hyndman’s input. Hyndman’s goal is to make the program a staple on campus — he and longtime assistant Brent Erwin even taught a “Soccer 101” seminar for students and faculty — and a player on a national scale. Don’t forget the presence of Schellas Hyndman. He’s just getting warmed up.